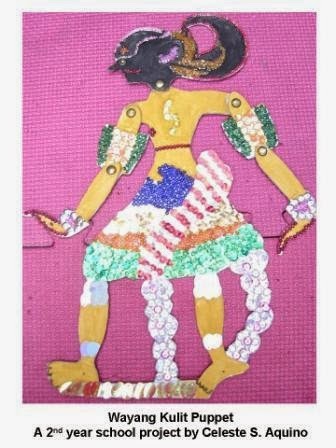 Toastmasters Speeches: Reading a Story-Sample Speech, "The Legend of Bandung Bondowoso"
Reading a Story-Sample Speech, "The Legend of Bandung Bondowoso"
Is there anybody familiar with this figure or the name “Wayang Kulit”? Well, Wayang Kulit is a form of puppetry that originated in Indonesia. Through this art form, Indonesians portray the stories of goddesses, deities and heroes. One of the more celebrated stories is a legend and this is the Legend of Bandung Bondowoso. Once upon a time, there was a vicious king by the name of King Baka, who liked to sacrifice and eat young men everyday. This behavior caused the people to panic, but they could not do anything because the king was so powerful. So everyday he sent his soldiers to find people suitable to be killed. These soldiers looked as vicious as their master. But the soldiers were also afraid of King Baka, because if they failed to find the victim, they became the victims instead. So, many people fled to find safety away from the vicious King. Fortunately, a neighboring kingdom was headed by a very wise king named King Pengging. King Pengging always took care of his people and protected them against any threat. He heard about the vicious king, and he tried to find ways to kill King Baka. He knew that one day the vicious King Baka might attack his Kingdom. The wise King had a son named Prince Bandung Bondowoso, his only son whom he loved so much. Prince Bandung grew up to be a young man whom his father expected to take over the kingdom at a later time. One day Prince Bandung asked his father’s permission to live and meditate in a faraway place to gain spiritual strength. His father was very pleased with his son's idea. After many years, Prince Bandung came back as a powerful young man, invulnerable to injury because of his powerful spiritual strength and magical skills. All the people were very happy to see Prince Bandung return home, especially his father. The people of King Pengging’s kingdom expected Prince Bandung now to be able to kill the neighboring vicious King Baka. King Pengging told the prince to prepare for battle with King Baka. The next morning, Prince Bandung and his soldiers marched to King Baka's Palace. And a battle ensued for more than 10 days. But in time the younger Prince Bandung was able to defeat King Baka’s men. Finally with his last blow, Prince Bandung killed King Baka. The victorious Prince Bandung went through every part of the palace, and found King Baka’s beautiful daughter, Princes Lorojonggrang. He was stunned and surprised that the vicious King Baka had such a beautiful daughter. In his heart Prince Bandung admired the princess' beauty. If he had known that King Baka had a beautiful daughter, he would not have killed the king. Prince Bandung felt pity for Lorojonggrang but he could not undo the killing of her father. So, Prince Bandung approached Princess Lorojonggrang saying that he did not know that King Baka had a beautiful daughter. She moved away frightened. She asked Prince Bandung if he was the one who killed her father. The Prince answered, “yes”. Prince Bandung appeared strong and well built but had an ugly face. Gently he approached her and whispered: "If you marry me, I will give anything you want". He added, "Don't think what has happened. If your father were alive, I would extend my proposal to him. But things have been done and the gods have decided our fate." The princess remained silent. She wanted to stay alive but did not want anger Prince Bandung. She decided that she would not marry an ugly man, whoever he was. And so she devised a strategy. Princess Lorojonggrang agreed to marry Prince Bandung on one condition. She said, “I will marry you if you can build me 1000 temples in one night. The Prince was surprised at the condition she proposed. He said, "Why must I build so many temples for you?" Princess Lorojonggrang answered, "I love temples. They beautify the gardens in our kingdom. They will be nice for our future children to play in." The Prince was stunned for awhile, but his love to Lorojonggrang and his magical skills made him decide to build the 1000 temples as proposed. Before sunset, he meditated and asked help from all the spirits to help him build the 1000 temples. Then the work started. With the Prince helped by all the spirits and demons, the work ran so fast that it worried Lorojonggrang. She prayed to all the deities, saying that it was unfair for her to marry an ugly man like Prince Bandung. The deities whispered to her what she must do. Very early in the morning, before the roosters started crowing, she went out from the Palace heading toward the village. There she ordered all the villagers, mostly women, to beat the bamboo drums, creating a loud noise as a signal that sunrise was approaching. Suddenly, the roosters started crowing more, and louder until all roosters in the village were crowing together. Everyone came out from the houses carrying their farm tools to work in the fields. The spirits and demons now hear the drumming and believe the morning sun will come out soon. The spirits were afraid of seeing people and so they fled and the working on the temples stopped. The princess had found a way to trick Prince Bandung away from his work. Prince Bandung was surprised. Why had the work stopped? He counted the number of temples that were finished. In all, there were 999 temples. One more temple and he would be able to marry Lorojonggrang. He looked around trying to find what had stopped the work. Then he saw Lorojonggrang still banging on the bamboo drum, accompanied by the village women. Prince Bandung realized that it was Lorojonggrang who caused the work to stop. Prince Bandung shouted at her angrily, "Lorojonggrang, now I know that you are a very treacherous woman, a liar, a vicious woman. I almost finished making the 1000 temples, why did you interrupt my work. One more temple and you will become my wife." "Calm down my dear Prince." replied Lorojonggrang. "It seems that the gods did not permit us to be husband and wife" continued Lorojonggrang. Prince Bandung's anger was no longer under control. "You are not worthy to live, may God curse you" yelled the Prince. "Since I need one more temple to finish the 1000, I will make you the statue of Lorojonggrang to complete my 1000 temples" shouted the Prince, roaring like an angry tiger. The Prince was silent. He was amazed yet regretful that the Princess had really changed into a beautiful yet cold statue. It is said that among the statues in Lorojonggrang Temple in Prambanan, this is the only statue that looks lonely. The story of Prince Bandung is a tale reminding people, that excessive power can mislead one's wisdom, and when one is unable to control his anger, his action will bring tragedy upon him. 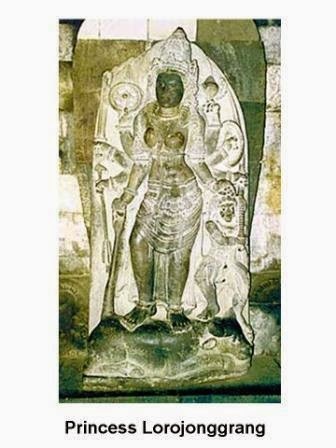 So, if by chance you get to visit Indonesia and go to the Prambanan temples, you might see a statue that looks like this. (show picture of Lorojonggrang again) This is what they say was the Princess Lorojonggrang who many centuries ago became stone statue, cold yet still beautiful.